On 29 September, some of the Veterans Raffle team were lucky enough to visit Longleat’s Military Spectacular – a wonderful celebration of the armed forces and an opportunity for the public to give thanks. For the second year running, this celebration of the armed services took place over the last weekend of September. As well as playing host to a wealth of impressive armoured combat vehicles for land and sea, interactive demonstrations and rousing musical processions, Longleat provided people of all ages the chance to get up close to military machines and engage with military personnel. From stepping aboard a Rigid Raider or getting the view from atop an AS-90 self-propelled howitzer, to weighting a missile or getting behind a L118 light gun, to getting in the driving seat of a Green Goddess or exploring the cockpit of a Gazelle Helicopter, it was fantastic to see children taking such as interest and developing a better understanding of what our armed forces do. 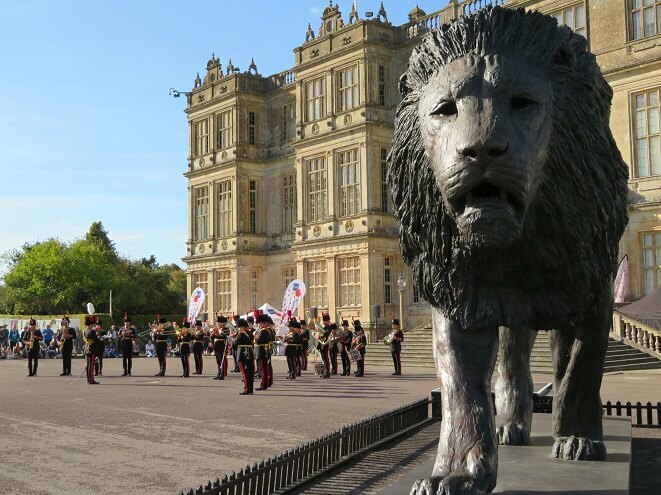 It was just as pleasing to see the military, many of which are based in Wiltshire, enjoying some downtime as they visited the safari park and surrounding attractions with their families between performances and demonstrations. It was also a pleasure to see the Marquess of Bath, and Viscount Weymouth with his family, at the sunset ceremony where members of the public, the armed forces and the military bands gathered on the front lawn of Longleat House. Veterans Raffle hopes that this event continues in the coming years so more awareness can be created of the great work the British Army, Navy, RAF and Special Forces do. We hope that you will consider supporting our Armed Forces & Emergency Services veterans charities via our Veterans Raffle.